The first time Tom Petty came home with some cash he’d earned from playing in a band, his mother thought he’d stolen it from somewhere. At the time, the likelihood of a teenager in Gainesville, Florida making money by playing music seemed exceedingly remote and unrealistic. Yet, The Beatles’ iconic performance on the Ed Sullivan Show had galvanized Petty’s adolescent enthusiasm for music into a practical ambition, one that would feed a steadfast pursuit of a career in rock and roll. The story of that pursuit is chronicled in a fantastic new film, Tom Petty And The Heartbreakers: Runnin' Down A Dream. Directed by Peter Bogdanovich, this four-hour documentary traces Petty’s life in full circle, from his youth in Gainesville to his momentous 2006 homecoming concert in commemoration of his thirtieth anniversary in music. Tom Petty tells his own story here, along with Heartbreakers past and present. Vintage footage, including home movies and rare television show clips, supplements the narration with valuable context and substance. As well, commentary by the likes of Stevie Nicks, Jeff Lynne, Eddie Vedder, and Jackson Browne offer a unique perspective of Petty, from friends and colleagues who admittedly are as much fans as the people who come to his concerts. Petty’s absolute sense of purpose, a trait evident since childhood, serves as the recurrent theme of this film. The way he explains it, he pursued his rock and roll dream as if there were never any alternatives or potential hindrances. The fact that he persuaded others to go along with his audacious plan seems all the more astonishing. For instance, when he first asked guitarist Mike Campbell to travel with him to Los Angeles in hope of scoring a record deal, Campbell conceded that he’d already planned to enroll at the University of Florida. “You don’t want to do that,” Petty dismissively said. When Campbell then commented that if he didn’t go to college, he’d likely have to join the Army because of the Vietnam draft, Petty sardonically shot back, “Oh, we’ll get around the Army.” That combination of brazen confidence, sheer determination, and naïve optimism underscores nearly every aspect of Petty’s career, which this film illustrates completely. 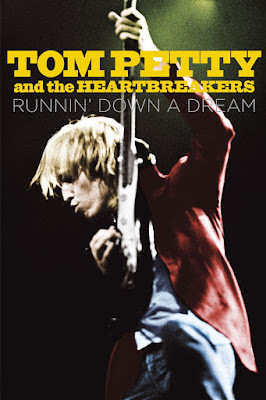 Tom Petty And The Heartbreakers: Runnin' Down A Dream remarkably chronicles a prolific career that’s yielded dozens of instantly recognizable songs and countless good times for all who’ve cared to listen. It’s an indispensable documentary on one of America’s most successful rock and roll bands, whose leader never backed down in aspiring to his ambition.